Busy day? Stay full and energized until lunch with this perfect morning smoothie. Packed full of vitamins and minerals, this smoothie gives you a one-two punch of antioxidant power!! Woop Woop!! Because the caffeine content is so low, a cup of green tea is rarely a realistic substitute for that morning cup of joe, nor does it function as any kind of reliable pick-me-up. Matcha, however does offer a significant dose of caffeine — 40 to 70mg depending upon type and amount used. A cup of Matcha provides a jolt of energy that lasts longer than the typical coffee buzz. Without the jitteriness or irritability that coffee can impart, Matcha’s sustainable energy is smooth and consistent. With generous amounts of the amino acid L-Theanine, matcha can put you in a good mood. Because it is grown in the shade, matcha contains up to 5 times more of the calming neurotransmitter L-Theanine than regular green tea. L-Theanine activates the brain’s alpha waves, resulting in a feeling of calmness; combined with matcha’s caffeine content, the drink offers sustained calm alertness. 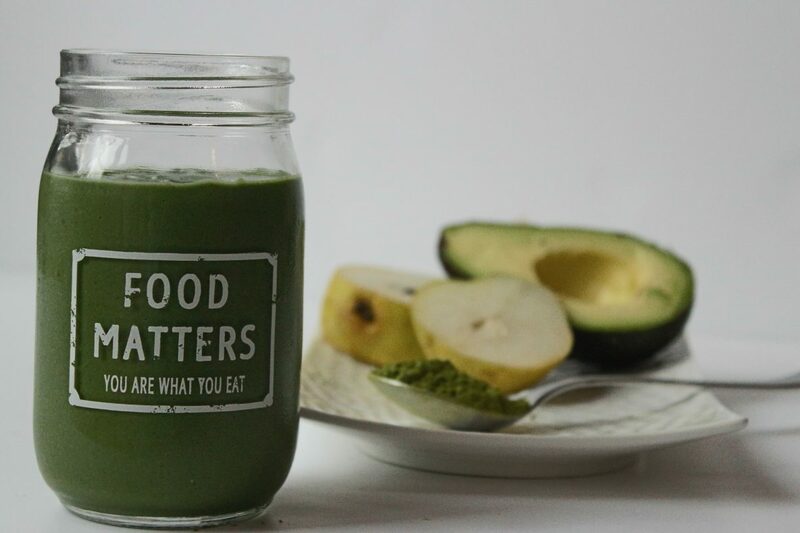 Rich in the EGCG antioxidant, which helps to prevent cell degeneration and premature aging, one cup of matcha has the antioxidant equivalent of 10 cups of regular green tea. Boosting your body’s ability to burn fat, consuming matcha regularly improves the body’s ability to utilize energy, according to a study by the American Society of Clinical Nutrition; the research showed that the daily energy expenditure rate of adults increases 35-45% with regular consumption of matcha. Catechins are powerful antioxidant compounds found in green tea; a specific type of catechin, EGCG (epigallocatechin gallate) comprises 60% of the catechins in Matcha. EGCG is recognized for its cancer-fighting properties as they have been found to offer beneficial protection against some types of cancer growth, including breast cancer.